• Tow with confidence. The Falcon has been designed with superior strength and safety. Stainless steel looks better, lasts longer, and works better than the competitive products. 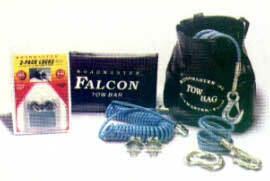 • he Falcon eliminates the need to lift the tow bar off the front of your car. In seconds, the Falcon can be easily stored on your motor home. 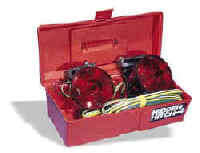 No need to leave it on the front of your car and no worries about where to keep the tow bar when not towing. • Auto-lock System allows arms to adjust for an easy, one-person hook-up. Stainless steel assures trouble-free operation. • Our exclusive internal safety collar adds an additional measure of safety by preventing the separation of the tow bar in the unlikely event that the primary lock should not function. • The Falcon incorporates bushings at the swivel points that help support the weight of the tow bar during the hook-up and unhook procedures.